Capitalism is good and needed for faster economic growth! Unbridled avarice and greed bad! Capitalism as an economic growth engine! Corruption under Capitalism can be fought, as proved in South Korea and Brazil where elected Presidents were impeached and removed! Actually Indian politics needs to be sensitised over how to tackle the corruption that is now unbridled and almost unstoppable! 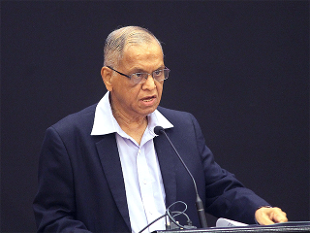 A recent controversy erupted over Infosys founder N.R.Narayanamurthy’s criticism of his own company now managed by professional management paying high salaries to the CEO and the COO, as high as Rs.50 crores to 40 crores. But then the board quickly justified saying the high salaries are in tune with the trend. Of course, other Indian companies to pay high salaries! The point here Infosys has set a target for 20 billion dollars in the next few years! Some experts, from management and other sectors argue that capitalism is after all what it is and what it does. Capitalism is good and it creates wealth. So too jobs and cuts poverty. It is another thing that Capitalism had a very controversial past, starting from Karl Marx days. Capitalism has a great history : Capitalism has also a great history. It is the economic system where the entrepreneur takes big risks and invests capital and triggers economic growth. Now, in the new century, with India, China and the USA in mind, we have to see that it is the US economy, the engine of economic growth. But China’s growth rate is 6.7, India 6.6 and the US So, the whole world looks to India as the next big story! Also, China, a Communist country has adopted the capitalist system, with state enterprises and has shown to the world, it is now the world’s third biggest economy, India is predicted to become the third big economy. Russia is nowhere in the picture! What if, if there are millions under poverty. At least we have found out new ways to accelerate economic growth. We have the technologies, Internet, also technologies like AI (Artificial intelligence, Robotics and many else! Education has also spread as never before! In every country of the world, from Africa to Asia and elsewhere, there is a furious spread of education. So too medical help and healthcare. Take agriculture, a field in which we are engaged, in spite of much indifference and ignorance of policy makers, there is now the realisation that we can now feed the world. World hunger is attacked squarely by FAO and other agencies. If you study the big economies there is great deal of poverty in the world and also inside India. To cut the story short, we have to see that Capitalism is the only way, it seems, that thrived and transformed the post-war world. In 1989 Communism collapsed that was hailed as the end of history! Even in the IT and Internet era it is Capitalist, the knowledge economy where you find the new IT billionaires coming from. The world under the new economy has produced unprecedented wealth on the global scale. It is rightly observed that we live at a time when we witness the world poverty significantly and world’s wealth production scaled new heights on an unprecedented scale. The per capita income on the global scale has increased, though, as it is often quoted that still there are millions of people who live on 1.25 dollars a day! Capitalism now changed : It is now a caring capitalism, a compassionate system. Capitalism and the history of the modern world is a fascinating story. Max Weber’s (1864-1920) “The Protestant Ethic and the Spirit of Capitalism” is one classic every one of us, who are all concerned with economy and the economic policy making must read and get some enlightenment. Max Weber saw capitalism as a rational organisation of formally free labour. Capitalism is also seen as dominated by the making of money. Economic acquisition is no longer seen as subordinated to man as the means of satisfaction of his material needs. We all seek material comforts and economic security. And so Capitalism is getting a good grade! But for various reasons that capitalism always attracted criticism, from the time of Bible to the present times. Property was seen as a ‘theft’ and somehow man’s greed came in for much criticism. The Bible asked: “Why are the many poor?”No suitable answer is forthcoming! Yes, it is for the profit seeking motive of man only Capitalism exists. As Adam Smith famously said:”It is not by the benevolence of the butcher you get your dinner. It is for the self-motivated benefit only the economic ends are met! So, in spite of calling for an ascetic way of lifestyle, simplicity and restraint and all that, you have to admit that capitalism exists, existed for all the wrong reasons, as Marx would argue. Marx thundered about the bourgeoisie exploitation and the class conflicts that was to lead to the capitalist collapse and the rise of the dictatorship of the proletariat! We know how history has proved! Karl Marx’s later years : But as I read in one of the latest biographies of Karl Marx(Karl Marx, Greatness and Illusion, by Gareth Stedman Jones, Penguin) how Marx too became a sort of bourgeois gentleman himself in his London days and enjoyed certain material comforts! So, every one of us who speak of high moral principles have to be modest in our language and expressions. The exploitative capitalism is still there, right here in our own midst. But at the same time we have to see how capitalism also has changed over the years. It is now a lifeline for the millions of poor in one generation to get out of the poverty trap.